A helping of smoked salmon on each – about 75g in total. 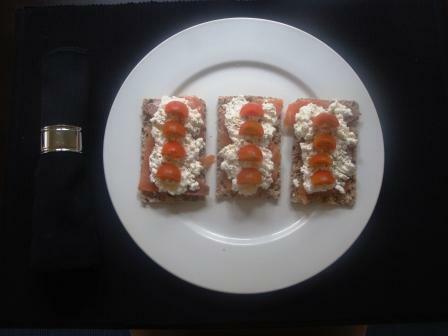 Topped with cottage cheese – again about 75g in total. Garnished with cherry tomatoes cut into quarters and plenty of black pepper. This is my current favourite lunch – and at only 4.5 points for the lot, it’s a healthy one too. Next > five memorable meals – are you in? >I like this recipe – so simple, it's the perfect super light work lunch. Keep'em coming!